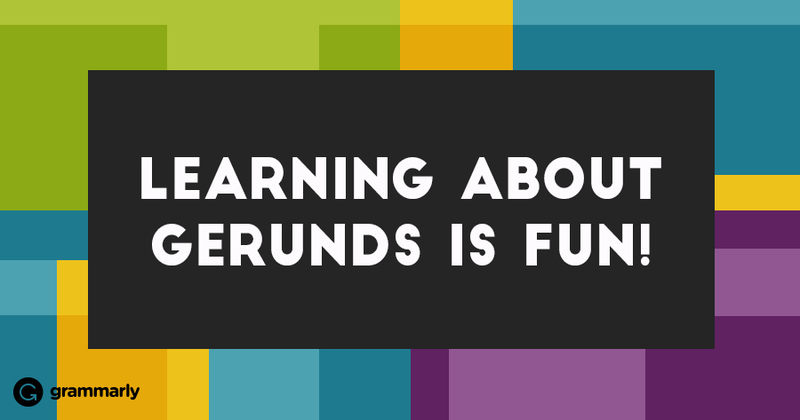 Can you spot the gerund in the sentence “Learning about gerunds is fun”? No, the answer isn’t gerunds. It’s learning. To understand gerunds, (pronounced JER-undz, by the way) it helps to understand the difference between a word’s grammatical form and its grammatical function in a sentence. Gordon is dancing up a storm. In the sentence above, dancing is a present participle (form) and it’s acting as a verb (function). But there is another way you can use the word dancing. Dancing is all Gordon can think about. Dancing looks just like it did before. But in this sentence, the word dancing is not acting like a verb. It’s acting like a noun. In fact, Dancing is the subject of this sentence. It still looks like a present participle (form), but in this sentence, it is filling in for a noun (function). When a present participle is used as a noun, it’s called a gerund. Gerunds are marvelously flexible. They allow you to talk about an action in an abstract way. And because they act like nouns, you can use them anywhere that a noun would normally go in a sentence. Gordon’s main interest in life is dancing. Gordon got those muscular calves from dancing. In some sentences, a gerund can also take the place of an infinitive. To dance is Gordon’s only ambition. Dancing is Gordon’s only ambition. Gordon loves to dance. Gordon loves dancing. If you wanted to, you could replace dancing with a regular noun like root beer in any of these sentences. Root beer makes Gordon happy. Gordon loves root beer. Gordon’s main interest in life is root beer. Gordon got those muscular calves from root beer. The sentences still work grammatically, even if they are a little nonsensical and make Gordon sound like he needs to get out more. And that’s all you need to know about gerunds! Didn’t we tell you learning about them would be fun?